Before Kurt Cobain was on top of the grunge music world, he was a budding artist trying to win over music critics and introduce his sound to fans. The new book "Experiencing Nirvana: Grunge in Europe, 1989," written by Sub Pop Records co-founder Bruce Pavitt, brings to life a slice of Cobain's pre-fame world - before drummer Dave Grohl came on board and prior to the release of Nirvana's debut album, "Bleach," which surfaced on the Seattle-based independent record label later that year. After signing Nirvana to Sub Pop, Pavitt took the band on its first European tour in 1989, with opening gigs for label mates Mudhoney and Tad. Pavitt says that it was on that tour - when Nirvana played the U.K.'s LameFest at the Astoria Theater in London - that the band won over critics overseas. "Six months after that show, Iggy Pop was showing up at their New York Pyramid show...and DGC Records swept in and signed the band," Pavitt told CBSNews.com. "It was really a turning point in their career. I really think the eight days were kind of a microcosm of the band's career. There was definitely a lot of drama there at the beginning and a lot of obstacles, but at the end of the story, they completely pulled through and won people over." Pavitt sold Sub Pop to Warner Music in 1996 and now lives in Orcas Island, Wash., with his wife and children. But he has vivid memories of that trip, and luckily kept all of the photograph negatives. "About a year or so ago I went back into my box of grunge memorabilia to see what was in there," Pavitt said about finding pictures of the original Nirvana lineup. 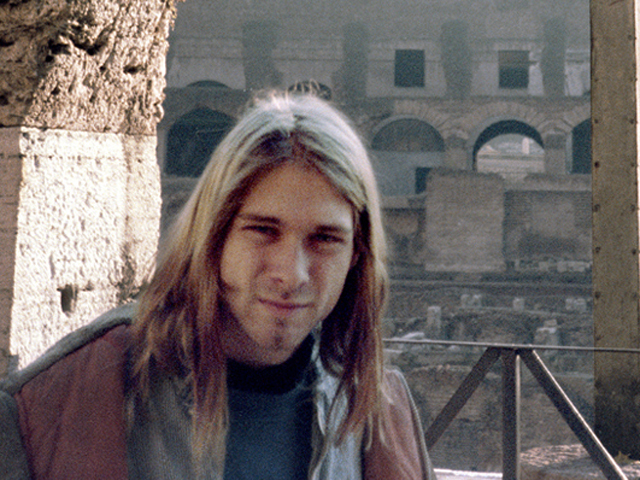 "There was one photo in particular that I remembered that was Kurt standing in front of the cross...in Rome. I wanted to revisit that picture, and in the process, I started going through the other photos and I realized that collectively that they told a story. It was a positive story." Through a series of anecdotes and some never-before-seen photographs, Pavitt tells part of the very early plight of Nirvana. The band had just burst on the scene in Seattle, an exploding musical hub at the time. With his Olympus pocket camera, Pavitt took countless shots on that eight-day Europe trip. Photos from venue stages and inside dressing rooms shed some light on a 22-year-old Cobain. "It was only the second time I had been to Europe, and frankly, I was in a pretty excited state. It's hard not to travel through cities like Rome and Paris and not be thrilled," Pavitt recalled. "I also felt intuitively that that this tour, this event leading up to London, was going to have some historical significance. I knew how powerful the crowds in the U.S. had been reacting to the band." But those eight days weren't the easiest on Cobain. "The tour was very grueling," Pavitt, 53, said of his intimate time with Nirvana. "On one hand, touring Europe when you're 22 is a rock star fantasy for a lot of young musicians. But once you get in the van, and you're doing shows day after day, it will wear you down...Kurt was very sensitive. And I think he had more challenges than most with dealing with the grind of getting out there." But Pavitt saw some other sides of Cobain, too. "At one point, we pulled him out of the van and said, 'Hey, we're going to spend 24 hours sightseeing, chilling out, getting some food.' I got to see a deeper part of Kurt's personality," said Pavitt. "I was extremely impressed with his knowledge of music. He was a big champion of fringe artists like Daniel Johnston...he proved himself to be a deep student of indie rock." "When Jon [Jonathan Poneman, Sub Pop Records co-founder] and I first heard the band we were really taken in by Kurt's voice," Pavitt remembered. "His material and the stage performance of the band hadn't quite matured at that point, but it was obvious that he had an incredible voice and as the band stepped into doing more touring, it was obvious that they were growing significantly, not only as performers but Kurt as a songwriter." Nirvana didn't stay with Sub Pop very long. By the following year, the group signed with DGC Records and went on to release its landmark 1991 album, "Nevermind." Fame soon followed, as did Cobain's untimely death. The Seattle rocker committed suicide on April 5, 1994. Pavitt recalled his time with Cobain when he spoke at the singer's memorial service in Seattle that year. "Going back to that more innocent period of Kurt's life kind of reawakened in me just that whole beauty of the indie culture versus the post-"Nevermind" corporate rock culture," Pavitt said about writing the book. "I think there's a lot to be learned from that period. Nobody was in it for the money because there was no money. I thought that putting that story out there could hopefully be inspiring for people."